It’s feels like your clients are talking to a real person. Our chatbots are friendly and convey a warm feeling. In return, you get great personal insights in your client’s situtation. Clients don’t want to download an app for every service. With a chatbot, you’re right in the middle of your client’s WhatsApp chats. Besides, we can integrate your chatbot with almost every softwae. Including your CRM software or webshop. Chatbots are new, exciting and the next big thing. It will give your brand a positive boost and client’s will associate your brand with innovation and accessibitily. Start now and impress your clients with this new technique! 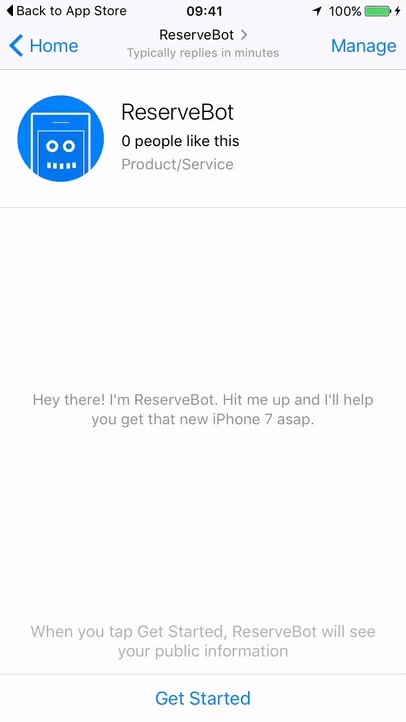 In September 2016 we launched our own chatbot which enabled users to easily set alerts in order to reserve a new iPhone as soon as possible. Excited about chatbots? Request your demo today!